Characterized by big juniper flavor, these gins are great for drinks that you want to have a strong flavor of gin to cut through your modifiers (think gin & tonic or Negroni). Some of the better known brands are: Tanqueray, Beefeater, Boodles, Gordons and Bombay. Plymouth gin is a style only produced by one distillery (Black Friars Distillery) and has been demarcated, meaning no one else can call their product “Plymouth” gin. Much milder than your standard London dry, Plymouth is made using a special water only found in that city. Another demarcated spirit, Genever gin can only be produced in Holland. Bols uses a blend of corn, wheat and rye for the distillate, a combination know as malt wine. Old Tom gin is essentially a slightly sweeter version of London dry. These gins follow pre-prohibition recipes and should be considered when making 19th century cocktails. The largest producer is Hayman’s Distillery and a few other producers have released versions in recent years. 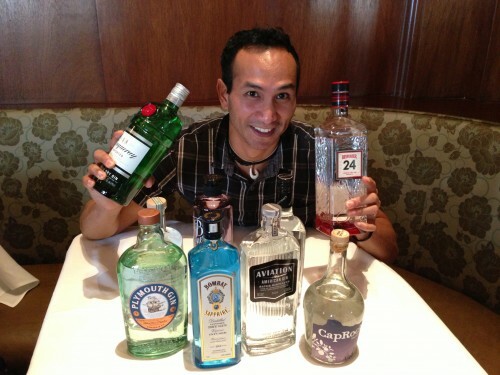 This is an unofficial category that classifies the newer gins produced in recent years. Generally characterized by more botanicals than juniper (setting them apart from London dry), some Western-style brands include Hendrick’s, Aviation and the St. George Distillery suit of gins. These tend to have lighter flavors and can definitely stray from the traditional juniper we associate with gin. Kevin recommends against simply replacing a London dry with a Western-style gin in classic gin cocktails as it may not hold up against the modifiers. Rather you should consider the flavor profile of the specific product and incorporate other ingredients accordingly. Lots of juniper and citrus. Tanqueray has a very traditional gin flavor and will definitely hold up against other strong ingredients like citrus or Campari. It can be readily used in all the gin classics like the Negroni and Gimlet and makes a fine Martini. Much softer with less juniper than a London dry. Kevin described it as “a good starter gin” for someone who’s not particularly into the traditional flavor (looking at my co-editor here). What really sets it apart, though, is an interesting viscosity that gives it a smooth, almost oily mouthfeel. Definitely recommended for a nice, light Martini. Very much a Western-style gin, Aviation has a whole lot of cardamom on the nose and palate—something to consider when making cocktails. Kevin recommends combining it with vegetable flavors like green pepper. I also suspect it would work well with orange. Another Western-style, CapRock is light and floral with hints of apples. A very delicious drink on it’s own, this deserves careful considering when mixing. Beefeater 24 is named as such because of a 24-hour steeping process with two kinds of green tea. Flavor-wise you get citrus, particularly grapefruit, and what can best be described as “green notes” from the tea. Fairly light in flavor, it can still hold its own. Kevin recommends mixing with shiso or mint. I’ve used it quite successfully with Lillet and St. Germaine. Bols actually has an almost whiskey-like nose from the malt wine distillate, something I found very appealing. There is hardly any juniper on the palate and it definitely can be described as having a dry flavor. Bols deserves special consideration in cocktails as well, given it’s departure from classic gin and the similarities to whiskey. I found the tasting to be extremely informative and want to give big thanks to Kevin for expanding my understanding of the category. I walked away with some great new knowledge and a nice buzz to boot. Now get out there and try some gin!